Guaranteed win at William Hill at the Cheltenham Festival! Place a £10 bet on any UK or Irish Horse Race between now and 14:50 on Thursday, and they willl automatically place a £5 free bet on the winner of the Ryanair Chase for you, guaranteeing you a win up to £100. New customers only. Qualifying bets must be placed at odds of ½ or greater. Minimum stake of £10 on your first bet. 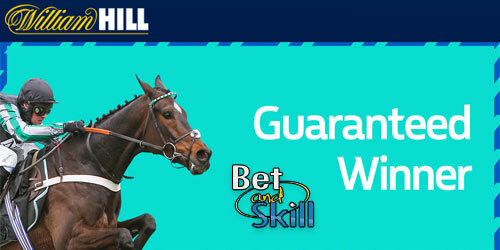 Customers not selected to take part in the Guaranteed Winner promotion, will not qualify for the free bet offer. 1. Place a £10 bet on any UK or Irish horse race between 15:20 Wednesday 15th March and 14:50 on Thursday 16th March, and we will give you a £5 stake on the winner of the Ryanair Chase. 2. Use promo code RC5 and stake a minimum of £10 on Horse Racing. 3. Your bet must be placed on a selection(s) with single/cumulative odds greater than 1/2 (1.5). 5. Winnings are paid as a free bet, up to a maximum amount of £100 (Example – If Kylemore Lough wins at 25/1. Free bet credited will be £100). 6. Qualifying bets are those placed on any UK or Irish horse race between 15:20 Wednesday 15th March and 14:50 on Thursday 16 March. 7. To qualify, £10 bet must be staked on horse racing. 8. Customers who have been informed that they do not qualify for William Hill offers and concessions will not qualify for this offer. 9. Due to the abuse of free bet promotions, customers using Skrill, Skrill 1-Tap, Neteller or PaySafe to deposit will not qualify for any free bet offer. 10. Applies to accounts opened in the UK and Ireland only using GBP and EUR currency. 11. This offer is exclusive to selected William Hill customers only. 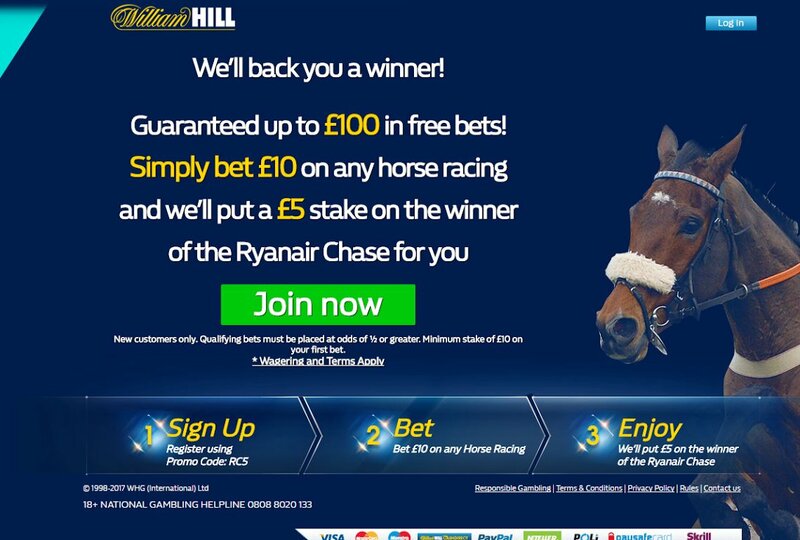 "Guaranteed Profit on the Ryanair Chase! William Hill will put £5 bet on the winner for you!"